For nearly 20 years, a dedicated team at Nebraska Medicine has been treating hepatitis C patients and continues to work toward offering the best therapies available. See a video about the clinic here. The specialty clinic serves as a referral center for hepatitis C patients in the region, and participates in the Hepatitis C Therapeutic Registry and Research Network (HCV-TARGET). 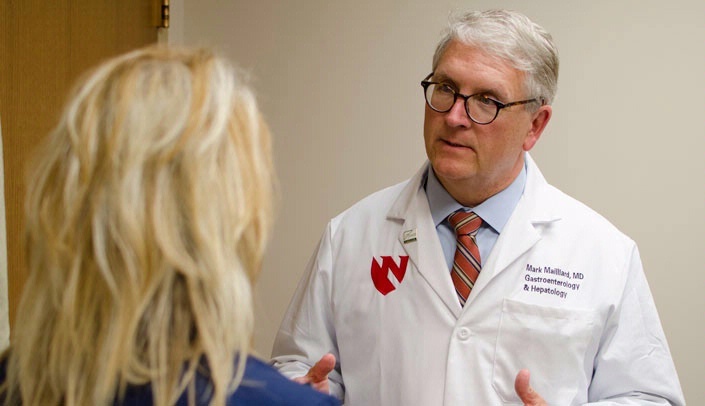 Dr. Mailliard said Nebraska Medicine and UNMC’s role in this network is important because in the next couple of years, several new, more superior medications will be approved for hepatitis C therapy. A dedicated team of medical colleagues work together to ensure the 25 to 30 patients seen at the clinic each week have the best possible experience. The medical team also includes pharmacists and financial assistance teams. Dr. Mailliard estimates that since the winter of 2013, 600 people have been prescribed medication for hepatitis C.
In addition to various clinical research trials, Dr. Mailliard said they also are working with One Chart colleagues to prepare a health maintenance alert. The alert would notify clinicians of the potential of their patients to have the hepatitis C infection. The continual improvement of therapies, research and seeing patients’ quality of life improve has brought many smiles to the faces of the Hepatitis C Specialty Clinic.